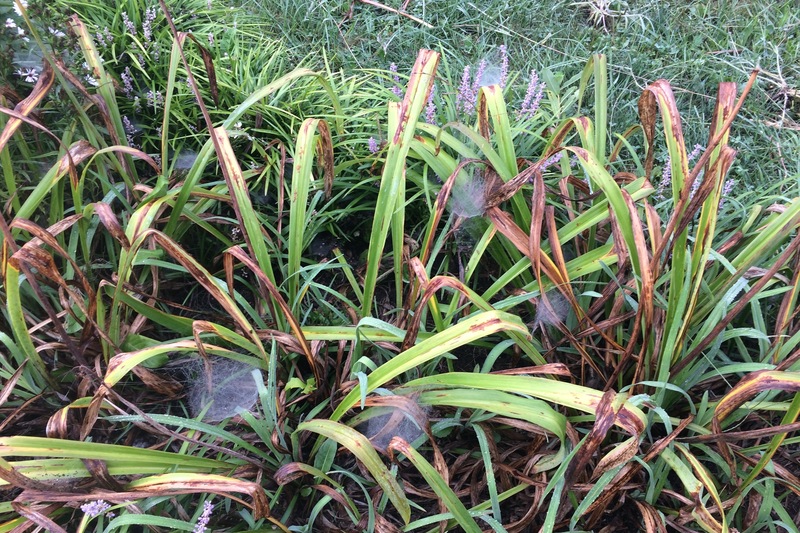 Though I was sad to send my daughter back to school earlier this month, I was looking forward to one thing: walking her to the bus stop in the morning and scoping out the spider webs in my garden. This shot was taken looking down into a patch of daylily leaves growing next to my front walk. Look at all of those webs! Whoever said you’re never more than six feet away from a spider wildly underestimated the number of spiders in the world! The early morning dew glistens on all of the webs and makes them stand out. They are everywhere. Webs as small as your palm or wider than a basketball, all made by spiders so tiny that you could fit several on your thumbnail. 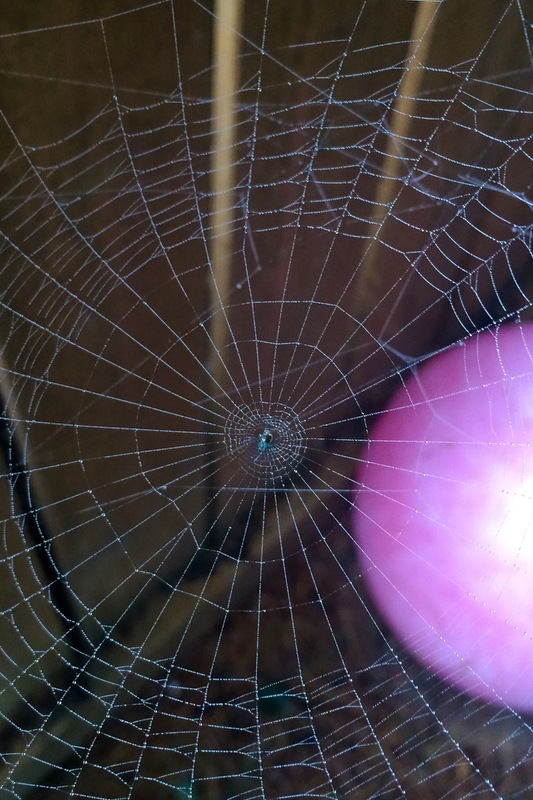 This beautiful orb web was made by that tiny glint of teal green in the center, an orchard spider. There are many species of orchard spider which share the genus Leucauge. It’s pronounced LOO-COW-GEE (the last G is hard) and is fun to say! 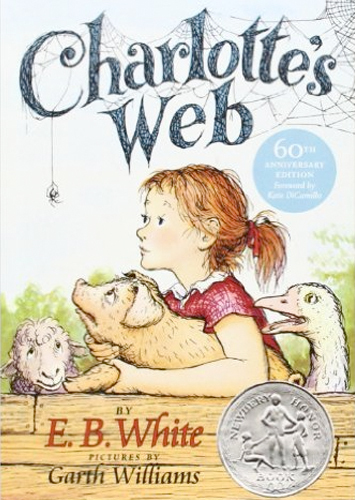 One of the very best children’s books ever written, Charlotte’s Web is a must have! The author, E.B. White, also wrote wonderful adult non-fiction about nature that I could read over and over. The more you know about spiders, the more friendly they seem. In my house, we name any spider we find “Charlotte” to remind us of that wonderful arachnid that saved dear Wilbur the pig with her fabulous web writing. We’re up to Charlotte XVI, I think, and we have loved them all. There are four main types of webs we see around here: cob webs (I call them messy webs), sheet webs, bowl and doily webs, and orb webs. 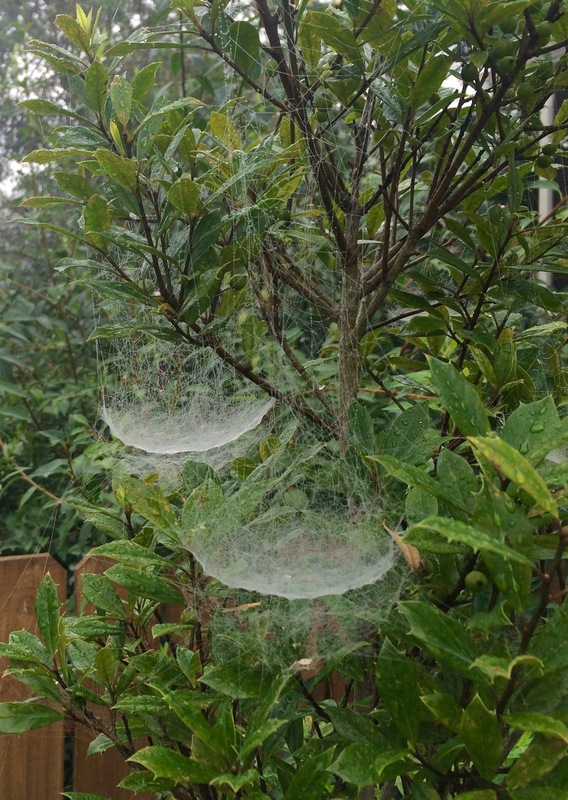 These are bowl and doily webs in one of my small holly trees. 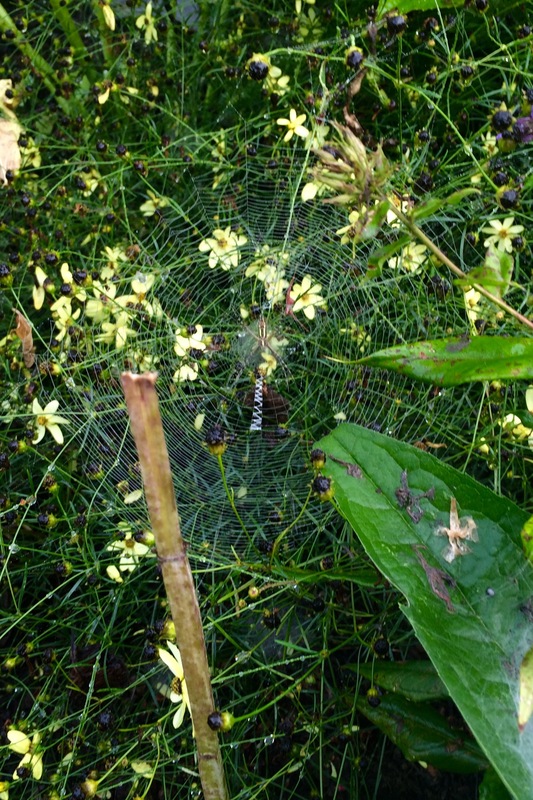 It’s easy to see how they get their name; there’s a bowl shaped web on top, with a flat doily-like web underneath. Bowl and doily spiders in my garden are tiny (less than half of my pinky nail), black, and have little white marks around the outside of their abdomen. 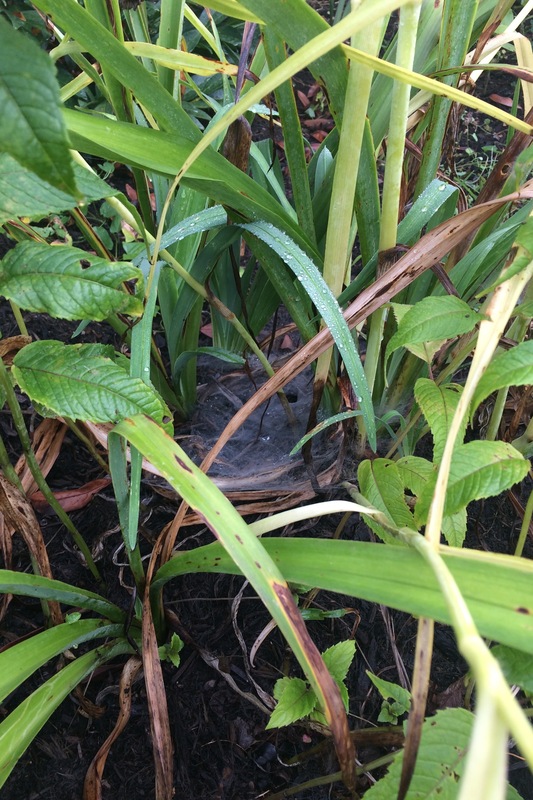 Tucked deep in the foliage and low to the ground I found this excellent example of a sheet (or funnel) web. This is an average-sized one, but I’ve seen them covering bushes as large as four feet high, wide and deep. The weaver of the web sits inside the funnel, waiting for lunch to announce its arrival by vibrating the strands of the web upon impact. None of the orb weaving spiders here are dangerous. No, really! They’re not! Meet Micrathena. 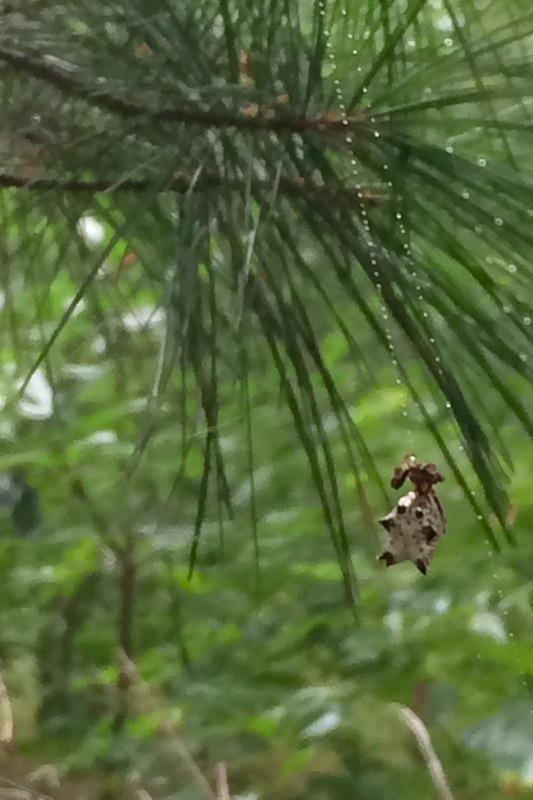 With that large, spiky abdomen, this little orb weaver is enough to scare off even the toughest nature explorers. Her cousins also come in devil-red and caution-yellow. Yikes! But she’s completely, thoroughly harmless. This picture is a bit fuzzy because I was trying to catch the shot while she was trying to get far away from me, and fast. The orb weaving spiders are all fairly small, but if you notice them at all, they’re usually female. The males are tiny. Girl Power! Sitting in the center of her web, legs held out in a large X formation, sits the lovely Argiope, also known as a garden spider or writing spider. The extra weaving running vertically at the center of her web is for stability, scientists tell us, but I often wonder if an Argiope might have been the inspiration for Charlotte. 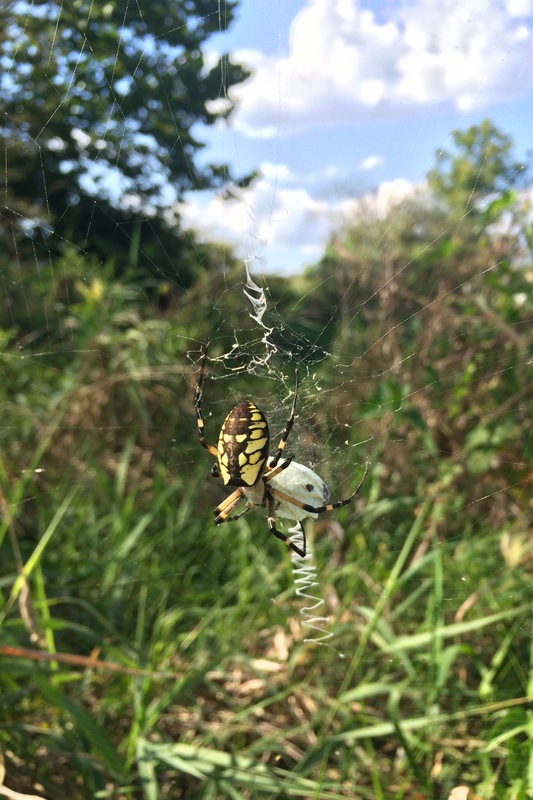 This is a medium sized Argiope; check out a bib mama Argiope at the end of this post. The long threads that anchor a web aren’t sticky, only the spiral threads that make up the circular portion of the web are. The threads that radiate from the center form the frame for the sticky spiral threads of the orb. 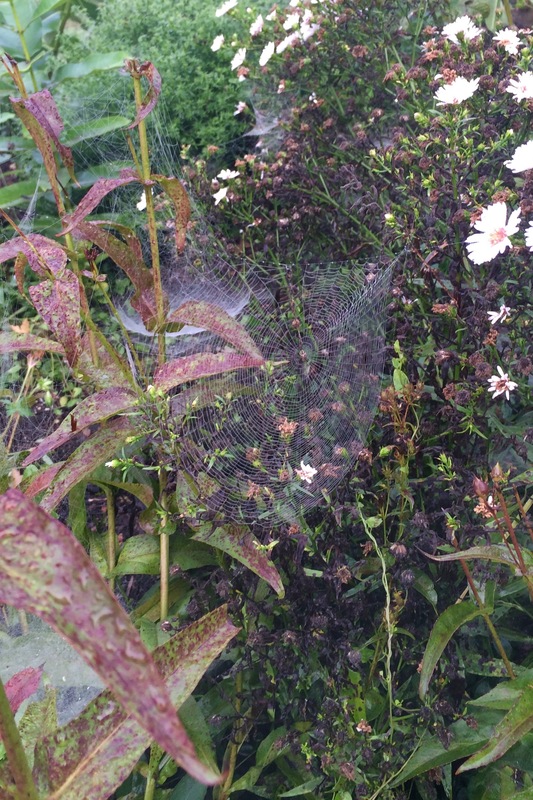 The long threads at the outside anchor the web to surrounding plants. Neither of these are sticky. The spider only deposits the sticky glycoprotein glue drops on the spiral threads. This stunning web sat just about at eye-height in a young dogwood tree in my backyard. I would have hated to accidentally destroy such fine work. Then again, spiders rebuild and/or repair their webs daily, so the little lady that made this would have caught her next meal with no trouble, regardless. Note the messy cob web behind this orb web – spiders have no trouble living next to one another and you’ll often find groups of webs situated close together. 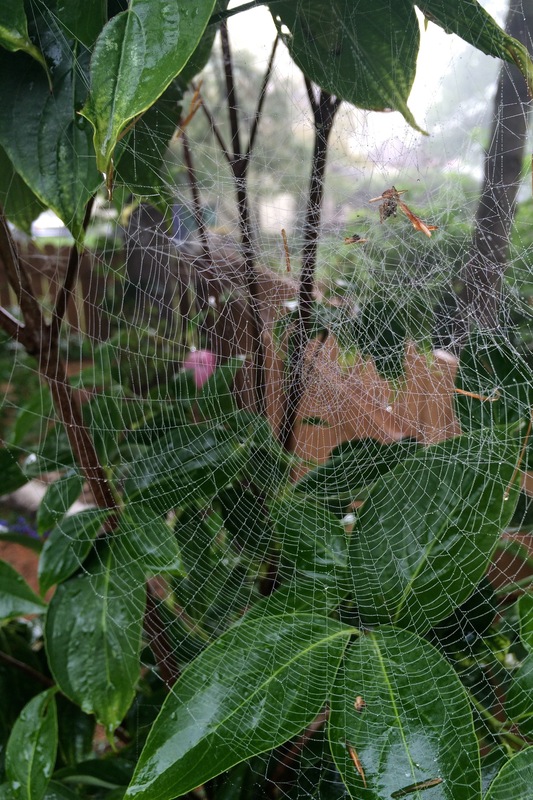 If you’d like to see a spiderweb more clearly and don’t have the morning dew to help, fill a used sock with corn starch, tie off the end, and pat the sock softly to release fine powder that you can gently blow all over the web. This works like a charm. A flashlight also helps for low-light situations and under dense forest canopy. Okay, here’s the big mama Argiope I promised. I photographed her just a few days ago on a sunny afternoon walk. She’s snacking on a cabbage white butterfly. She’s a little larger than a half dollar, legs included. She was gorgeous! Don’t be startled if you happen upon a large Argiope in your own garden – they’re incredibly good to have around to eat up insect pests. How do you know if a female spider doesn’t like a male suitor who’s come calling? How do you know if she does like him? She mates with him . . . and then eats him. See? These creatures are fascinating! I’ve thought about it some more and come up with the hypothesis that the reason so many of us recoil with shivers and cringes at running into spiders’ webs is that we fear that the spider is now actually somewhere on us, getting lost in our hair or clothing or deeper wrinkles . . . and will bite if we should in anyway touch it or smother it or squeeze it. While most spider bites will not kill us or make us badly sick, they can be a pain, right? That’s the thing – the spider runs away toward the edge of the web, so the odds that it’s on you are veeeerrrry slim. And, even if it is, it’s too small to even bite you! Though I hope I can say that I've "done" my nature study here quite well, I'll never be done with this beautiful place. There is always more to learn and I will most definitely be back!